A delicious twist on a holiday favorite. The holiday season is a time of way too much baking for me. While I enjoy baking it seems that my family always needs something last minute to bring to their office/ school parties. So I like to keep ingredients in the house so I can whip up a last minute treat. 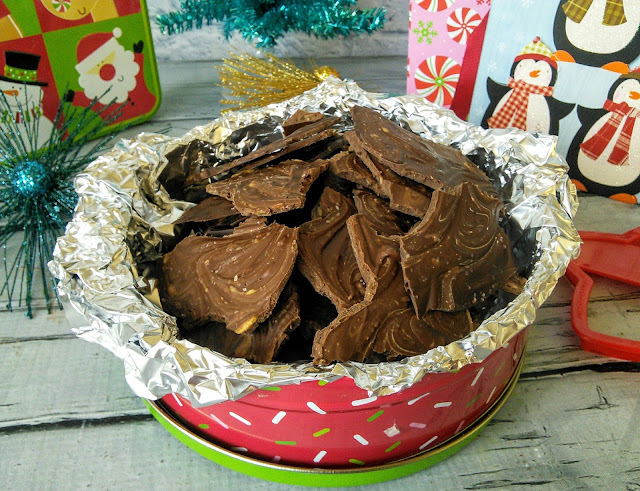 One of my favorite holiday treats to make is chocolate bark as it is so easy to make and depending on the recipe it only needs a couple of ingredients. Last week I made an easy peppermint bark for my son to bring to his class party and everyone loved it. This week I decided to make a peanut butter bark for my husband to bring to his office party. My husband loves that this treat is easy to transport to work. He rides the bus to work so bringing something like cupcakes would be hard for him. I just place the yummy bark in a holiday tin and my husband can then carry this treat in his backpack without any worries of it getting smooshed. My Easy Peanut Butter Milk Chocolate Bark only uses two ingredients but you can add other items to it to give it a different taste or look. I like to add pretzels, M&Ms, and peanut butter cups to mine. I did not add those to this recipe as I did not have any in the house at the time. This recipe is easy to double. Linne a baking sheet with a silicone sheet, wax paper, or parchment paper. Place the milk chocolate chips in microwave safe bowl and cook on high for 1 and a half minutes. Stir and cook in 30-second increments until melted. Make sure to stir after each 30-second cookings. Do not lick the spoon as doing so will get moisture on the chocolate and cause it too crumbled and not melt. Once the chocolate is melted. 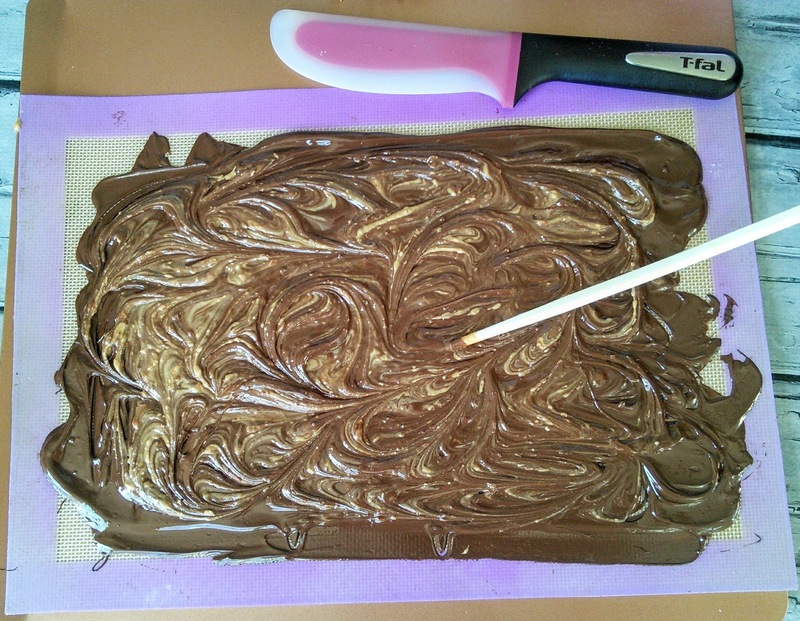 Then spread the mixture on the lined baking sheet and smooth it out to cover the entire pan. Place the peanut butter in a microwave-safe dish and heat in the microwave for 30-60 seconds until melted. 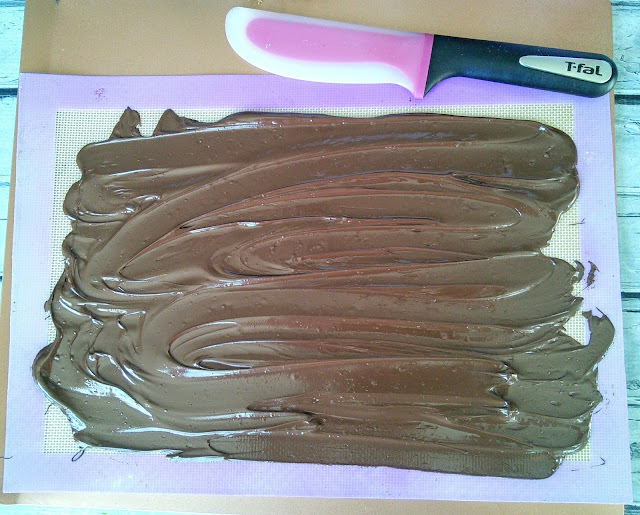 Once the peanut butter is melted, drizzle it over the milk chocolate that is on the baking sheet. Then use a toothpick to swirl it together. If you are adding a topping like pretzels, just sprinkle it over the chocolate. Cool for an hour or until hard. Then break the candy into pieces.